Maral Arjomandi - Dworkin, Chambers, Williams, York, Benson & Evans, P.C. Ms. Arjomandi received her B.A. from the University of Rochester and her J.D. from Case Western University School of Law. While in law school, she was an executive editor of the Health Matrix: Journal of Law and Medicine, and a Senator of the Student Bar Association. Prior to joining to the firm, Ms. Arjomandi was a law clerk for Reminger Co., LPA where she handled issues in workers' compensation, insurance defense, and other areas in civil litigation. She also practiced social security law in her law school's pro bono clinic. She is licensed in Colorado and a member of the Colorado Bar Association. 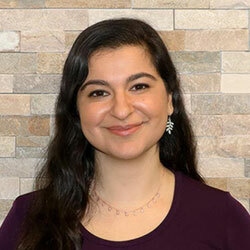 As a native to Colorado, Ms. Arjomandi enjoys hiking, camping, and volunteering at a local large animal shelter.